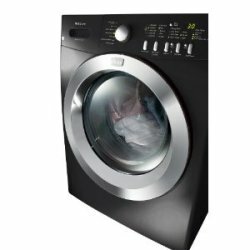 This line of washers from Frigidaire is highly efficient with some impressive features such as the WashSense Technology and Advanced Rinse Technology. Read on if you want to learn more about this model. The Advanced Rinse Technology uses a fresh batch of water to remove allergens and for a fresher-smelling load. Express Select controls allow you to easily select options with one touch of a button. The Quick Cycle feature allows you to wash loads for as short as 25 minutes. For quickie washes, this is the feature to use. You can pause the cycle if you need to add a garment with the Add-a-Garment feature. Multiple cycles allow you to choose among seven different cycles such as whitest whites and deep clean sanitize cycles according to the fabrics in the laundry. The sanitize cycle removes bacteria and germs from the load. The Delay Start feature allows you set the time you want the machine to start. You can set the machine as late as 14 hours before. The TimeWise technology means that you won’t have to wait a long time for the load to dry. Wash time equals dry time. The unit comes in a stylish finish and different colors. The energy-saving option is perfect for saving power and water. Cycle status lights and time remaining indicator help inform you if the load is done or how many minutes are left before machine is done washing. The drum light illuminates the contents of the drum so looking at what’s inside is easier. The control lock prevents kids from opening and closing the door of the machine. The silent design makes the machine stay quiet in the background when it’s running. The stainless steel tub resists rust easier and is less prone to chipping and discoloration compared to plastic or porcelain. In most cases, a stainless steel tub is also the best choice for faster spin cycles. The unit allows you to save your settings so you can automatically use them if you are doing the same kind of laundry. These models come in different colors so customers can choose the best color in the room. The energy-saving feature allows you to save a lot in water and electricity bills. The stain clean option makes taking out stain easy and convenient. The small capacity makes this machine not ideal for medium families. The unit also tends to become a little bit noisy after several months of use. The status lights also tend to die out first. different colors for more options. can easily take out stains with the clean option.